Hey Babes! I've got a great 15 minute circuit for you today. It's a tough one! Let's do the following exercises for one minute each, 3 rounds. Go as hard as you can for 5 minutes. If you need to, you can take a 30 second break between each set. You can do it! 1. Push Up to Pike: Start in a high plank position (hands directly under shoulders, feet hip width apart and core engaged). Inhale as you lower and exhale as you push up. From there, jump the legs into your hands, piking the hips up and engaging your core. Keep the abdominals strong as you jump the legs back to high plank. To modify, you can drop down to the knees for the push up. 2. Hip Lifts: Lay on your mat with you legs straight up in the air, hands underneath your booty. Engage the abdominals, press your spine into the mat as you lift your hips off of the mat. Gently lower back down. If you want to make this more difficult, lower the legs toward the floor before lifting the hips back up. Try not to gain momentum by swinging into it, but control as you lift and lower. 3. Squat Cross: With hands behind your head, feet shoulder width apart and toes facing forward. Bend your knees, shoot your hips behind and press through the heels to engage the booty. As you come up off the floor cross your right leg in front of the left. Squat back down and switch legs. Focus on the squat, getting low and focusing on your form. When you cross your legs keep the knees bent and quickly return back into the squat. 4. Lunge Jump: With one leg crossed behind the other, toes turned out, bend your knees and reach for the floor. Keep your abs engaged and chest lifted. Make sure that your knees are tracking over the toes. Press through the front heel engaging the abdominals as you explode off the mat, leaping as high and as far as you can before landing gently on the other side. Repeat, jumping right and left. If you need to modify (your legs will be tired after Squat Cross! ), keep it on the floor as you alternate from one side to the other. Again, make sure you land with knees bent and keep the chest lifted. 5. 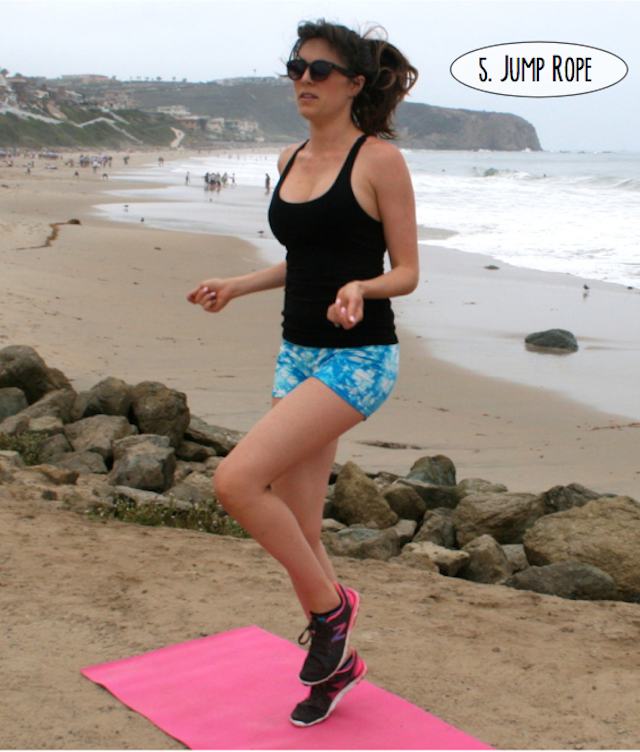 Jump Rope: I am using an imaginary jump rope here, which is totally fine. If you want to grab a real jump rope that's even better! I think we all know how to do this one... push as hard as you can. This is the last exercise in our set!